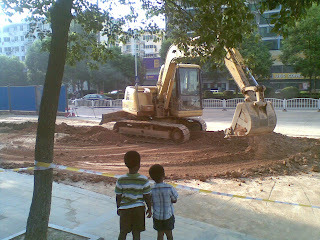 The boys enjoy watching as the construction began outside our house. Its been going on for months, so its not as fun now! Ooo...every boy's dream: construction outside their door. I don't know what my boys would do if we moved from teh busy street where ambulances and garbage trucks didn't go by often. So enjoying your blog. I though I better start commenting so you keep posting. Blessings to you all. Your family just makes me smile every time I see/think of you.